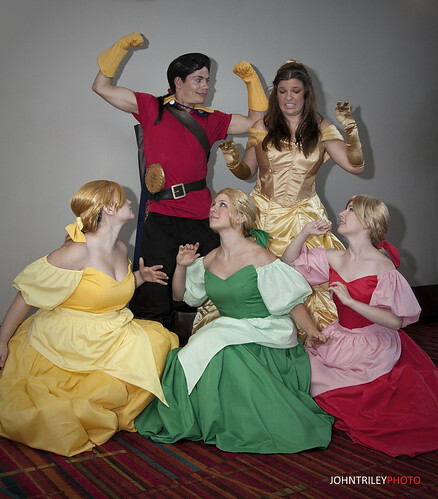 This costume was debuted at Connecticon 2012 in a group including Gaston and his three Bimbettes. 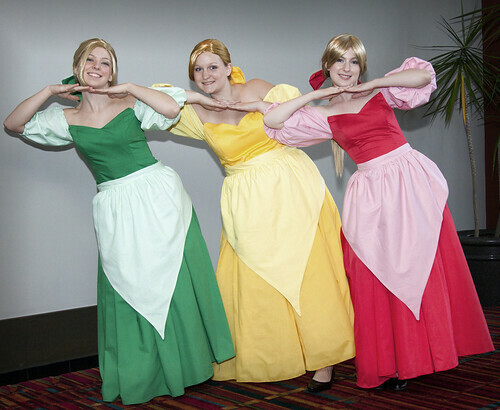 The three Bimbettes, as well as Gaston all collaborated on our outfits with the help of facebook to make sure that all of our outfits matched when the Convention finally arrived. 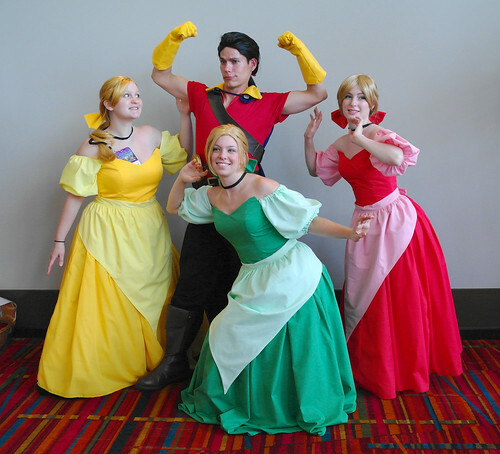 I am the red Bimbette, actually named Claudia, though everyone knows these girls as Gaston’s nameless fan club. It’s been a long time since I have made a comfortable, fairly generic costume. And I have never before had the opportunity to make triplet costumes (in that it is an identical dress worn by three people). We started with a party dress pattern from the 80’s, lengthened it, and made the sleeves bigger and longer. After that, we could pretty much follow the pattern to the letter, which is good because when you are twinning a costume, you need very precise directions, and the fewer modifications the better. As I mentioned before, us three girls were in constant communication over these costumes. We posted detailed progress updates and instructions to one another over the internet to insure that each dress would be exactly the same. My friend drafted the patterns for the apron, and I wrote the others a detailed photo tutorial on exactly how to cut and style their wigs. The bodices are comprised of three layers of cotton, boned, with a zipper in the back for easy in-and-out. The bows in our hair have no wire, but are double thick to give them more structure. We all bought the same type of fabric, and the same petticoats for under the dresses. We did, however, want different wigs because the girls in the movie do have slightly different hairstyles, and we wanted to keep some individuality between us. I added pockets to my dress but the others did not. I love adding pockets to costumes where ever I can–I am always missing phone calls at conventions when my phone is in a backpack because it is so loud! Even if I do hear my phone, I can never find it in time. With pockets, I have easy access to money, cell phone, and convention badge. We did all of our makeup together the day of the convention, starting with a matte foundation. We used brown eye-liner, black mascara, and a purple or taupe eyeshadow to sculpt the eye. We used bronzer to define the cheek bones, and blush to make us look just like princesses. Then we took a little bit of white highlight stage makeup, and accentuated our brows, tear-ducts, and the center bottom lid to make our eyes look bigger. Our shoes were all simple black flats–not that you could see them anyway. This costume and group was very well received at the convention. Just about everyone knew who we were and we had hundreds of pictures taken that day. Oftentimes we were asked to pose with children. That was a real treat. Kids get so excited to see Disney characters in person, and many of them mistook us for princesses. I like being treated like a princess. on September 8, 2013 at 7:27 pm | Reply Grace L.
Hi! 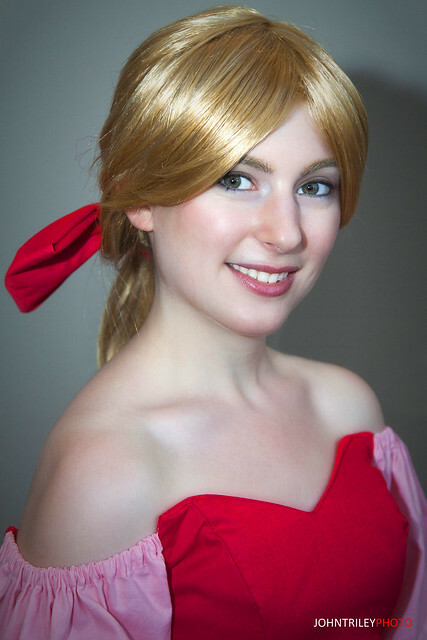 I love your cosplay, and I’m trying to collect all of the Disney dress tutorials I can find. I’m wondering if you’ve posted the tutorials you mentioned anywhere, and what specific pattern you used. You can see my page at http://happilygrim.blogspot.com/2013/08/disney-tutorials-for-not-so-grownups.html, and great job on your dress! I am costuming a high school production and love your Silly Girl costumes. I have dresses already but need to make the aprons ASAP.. Is it possible for you to please share your apron pattern? I unfortunately don’t still have the pattern. The aprons were drafted by the girl in green, and all three of us used the same pattern. It was very simple though; it looked like a hersey’s kiss turned upside-down. The top is slightly curved to follow the waist, and gathered with a wide stitch. Thanks so much! Do you think the top was double the width of the finished width for the gathers? Yes, about double. The gathers are not too voluminous. 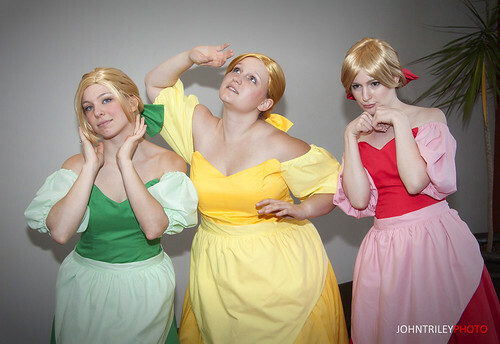 Do you happen to have a pattern for the dresses or Gaston? We are trying to piece together costumes for a kids production of Beauty and the Beast jr. and I haven’t found anything that even comes close to yours. Google 80’s puff-sleeve dress pattern and you will get a bunch of results. I can’t recommend a specific pattern in children’s sizes, since we patterned the dresses for grown women, but I think a vintage pattern is your best bet. You’re looking for puff sleeves, a sweat-heart neckline, and boned bodices. 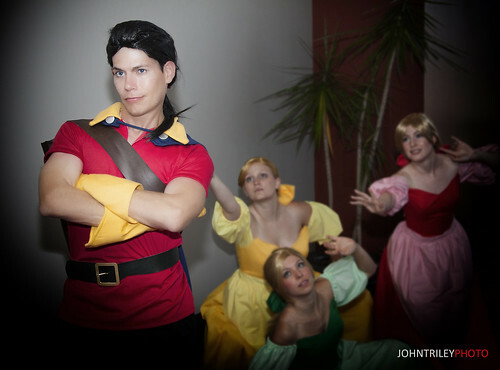 I do not know how Gaston made his costume.